Original soul sister Martha High sang with The Jewels back in the early sixties and then spent thirty subsequent years touring as a singer with with the late, great godfather of soul, JB, before jumping ship to do the same thing with JB’s former saxophonist Maceo Parker. And aside from a disco LP back in the seventies she hasn’t dropped a full length solo album until now – hence the title Soul Overdue. An understatement if ever there was one. Actually the lack of recorded output since the seventies thing isn’t completely true because she also did seven track album Woman jointly credited with French funk crew Shaolin Temple Defenders three years ago which various sources seem to have overlooked in their construction of the Martha myth. 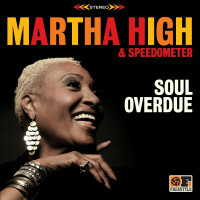 This is interesting because the set-up for Soul Overdue is rather similar – to wit: Martha hooks up with and fronts an already established funk band – although in this case it’s the UK’s Speedometer. 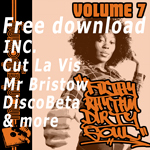 Soul Overdue is an eleven-strong set of funk, soul and soul jazz performed by Martha on vocal duties with, and features both oldies and newies. Among the oldies, indeed the highlight of the whole project, is Vicki Anderson cover No More Heartaches – a funky soul bomb which was the B-side to soul blues cut I’d Rather Go Blind (also on the album) on the recent single, but you might also recognise Aretha’s Save Me and Don Covay’s You Got It – famously sung back in the day by Etta. Want to get your soul jazz on? Try Sunny or Trouble Man. During her career, Martha’s probably forgotten more soul and funk than – say – your typical Jazz Cafe crowd and this is exactly the reason this’ll have such types frothing like a freshly poured espresso. File between recent Sharon Jones LPs and the debut from Hannah Williams & The Tastemakers. As always, Freestyle are guarding their unreleased output like a tramp with his last can of Special Brew so you’ll have to preview the full LP HERE below though you can check No More Heartaches via the soundcloud player, in full.